An on-duty NYPD officer who was captured on video last year grinding and twerking in the street with a participant in a “gay pride” parade has been cleared by the New York Police Department of violating any department guidelines. As previously reported, the viral video was recorded last June as over 20,000 people marched in the city’s annual parade, which stretched two miles from midtown to Greenwich Village. 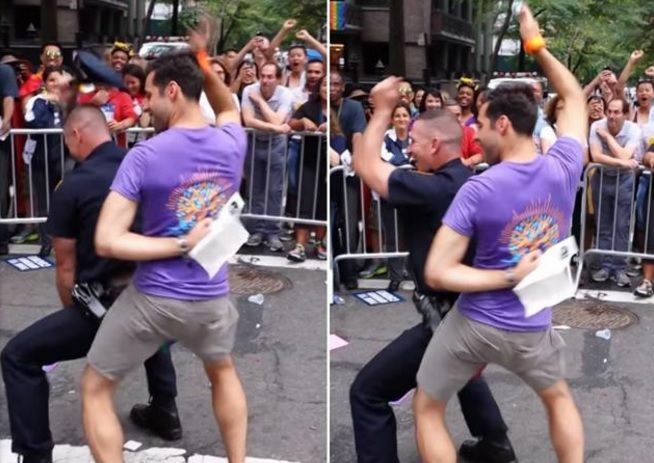 It captured a uniformed officer letting loose to the Michael Jackson song “Don’t Stop ‘Til You Get Enough,” and bumping his rear-end into the private area of the “gay pride” marcher. During the short video clip, the officer’s back was turned to the homosexual man dancing behind him as his holstered gun and handcuffs shook from his hips. The marcher, who has now been identified as Aaron Santis, then planted a pride sticker on the smiling officer and kissed him on the cheek. Paige Ponzeka, a member of the LGBT sports group Big Apple Softball League who recorded the incident, told BuzzFeed News that Santis approached the officer and began “grinding up against him” as he had been seeking an officer to “dance” with him throughout the event. The officer, who was dubbed the “dirty dancing cop” by various outlets has been identified as 111 Precinct Officer Michael Hance. The 17-year police force veteran and heterosexual father of two had been assigned to the parade that day. His Facebook cover is a prayer that he would walk close to God as a police officer. “When I start my tour of duty, God, wherever crime may be, as I walk the darkened streets alone, let me be close to Thee,” it reads in part. An integrity control officer, who only desired to be identified as Sergeant Michelle of the 111th precinct, told Christian News Network that Hance was not found “to be in violation of any department guidelines” following an investigation into filed complaints. Sergeant Michelle explained that Internal Affairs first conducted a preliminary investigation but passed on handling the matter, forwarding it to her and someone she identified as Lieutenant McKay for review. Commanding Officer Captain McBride signed off on the report clearing Hance of departmental violations. “He didn’t look like he was dancing any differently than I see other people dancing,” she stated. all ova di anti man all ova !! He needs to be disciplined in some way. He was on the job. If something went wrong and he was busy gyrating he would have been in deep trouble. well we have poltians in the BVI that is bi so what's the big deal? KML...The cat out the bag! It's moments like these that I call you ppl hypocrites. Had he been str8, and lets say he was assigned to the Labor Day parade, a woman came and grinded on him, would it be fine that he danced then? What's good for the goose, good for the gander. Ok I have seen NY police officers wuking up with ladies during the Caribbean Labor Day carnivals. That is why they could not do anything about disciplining this cop for Twerking with he man. lmao.